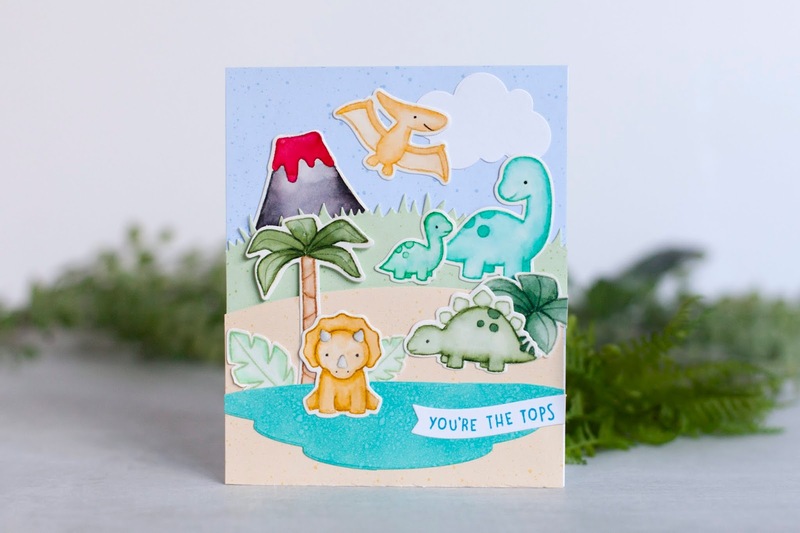 I was beyond excited to see more Dino stamps from Lawn Fawn. I absolutely love Dinosaurs ever since I saw Land Before time as a child. I think I got my sass from Cera si I of course had to use the puny sentiment for her. The sky, grass & sand are all the new Spiffy Speckles paper from Lawn Fawn. Its absolutely perfect for scene setting! The water is some distress oxide in peacock feathers and die cut with die from Bayou Backdrops. The sentiment is distress oxide in mermaid lagoon and I stamped it on the new Fancy Wavy Banners. All my images were stamped using antique linen distress ink and then colored using Tombow Dual Brush markers. They were blended using water and a paint brush. I am loving how this no line adventure turned out. What do you think?